The joint Alaska Airlines Negotiating Committee opened negotiations with Alaska Airlines management this week in San Francisco, California. Represented by the Company were: Wayne Newton, Vice President/AOCS; Jeff Butler, Vice President of Inflight and Call Centers; Jason Berry, Managing Director/Cargo; Denise Kliskey, COPS Labor Manager; Rebecca Meissner, Senior Attorney; and Melinda Maher, Division Controller. 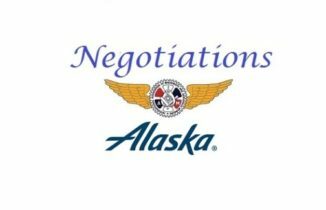 Joining your Negotiating Committee were: James Carlson, Assistant Airline Coordinator; Kris Hannah, Grand Lodge Representative; and Rich Pantoja, Special Representative. The joint Alaska Airlines Negotiating Committee continued negotiations with Alaska Airlines management October 23-25, 2018, in Seattle, Washington. Both the COPS and RSSA agreements were discussed during this session. Represented by the Company were: Wayne Newton, Vice President/AOCS; Jeff Butler, VP/Inflight and Call Centers; Jason Barry, Managing Director of Cargo; Bob Hartnett, Labor Director; Denise Kliskey, Labor Manager; Melinda Maher, Division Controller and Rebecca Meissner, Company Attorney. Joining the Negotiating Committee were: James Carlson, Assistant Airline Coordinator; Kris Hannah, Grand Lodge Representative and Brianna Gregory, Grand Lodge Representative.